I typically invest in handbags that are a more classic color, but this Gucci Disco bag in red has been one of my most worn crossbodies. 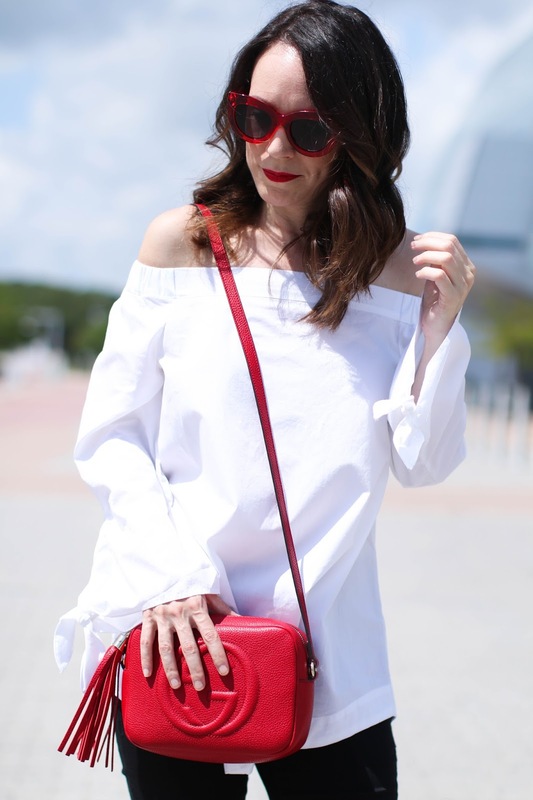 This shade of red is surprisingly easy to match with a ton of different items in my closet, so I am thrilled I stepped out of my basic handbag color comfort zone. I recently picked up this tote in wine for fall which is a tad out of the standard black/tan/gray options I go for, but I know I will get to wear it with so much in the fall and winter. In some non-fashion news, we moved into our new house last week! It's been quite a whirlwind these past few months with my father being so ill and ultimately passing away before we could all move together into our new home, but we are happy to finally be settled. And have space! LOL We were staying with my parents in a 2 bedroom apartment they were renting while the home was being built and to say things were tight is a major understatement. Now my mom has an entire floor on the ground floor of the home just for her, and Stan and I have the top 2 floors. We are still working out some kinks (like no cable/internet for the next two weeks - UGH), but I'm happy not to be in transition anymore. Yay for finally having my own office in the home now and a (huge eek!) walk-in closet! You look beautiful, classic and classy. Great outfit and great makeup.